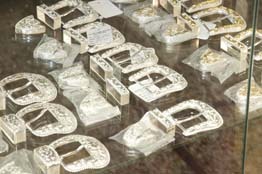 Factory Finish Shoe Repair is the place to go for that classic cowboy hat you've always wanted. Don't be shy - come by and try one on! When you exude the confidence and style of a young John Wayne, well, maybe things will finally change down at the office. We carry many brands and styles, and just like with our boots, if we don't have it, we can get it for you. 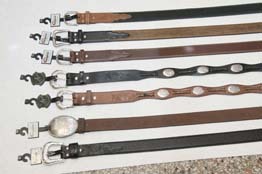 We also carry imported and custom hand-made belts, crafted right here using only premium quality materials. 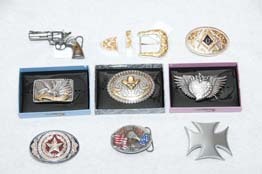 We have a large selection of dazzling belt buckles, and we can also special order custom-made buckles for you. Cowboy and Western Hats - starting at just $20! Custom hand-made belts starting at $30. We can fit all! 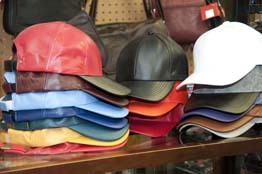 Since 1950, Factory Finish Shoe Repair has been serving Dearborn, Detroit and surrounding areas in Michigan with expert leather repair work and premium quality leather and Western merchandise. Visit us today! We have plenty of free parking, great prices and good old-fashioned customer service with a smile. Go that extra mile to come and see us, and we'll return the favor!